Today was Day #5 of Chocolate and Holiday Spice Theme Week. 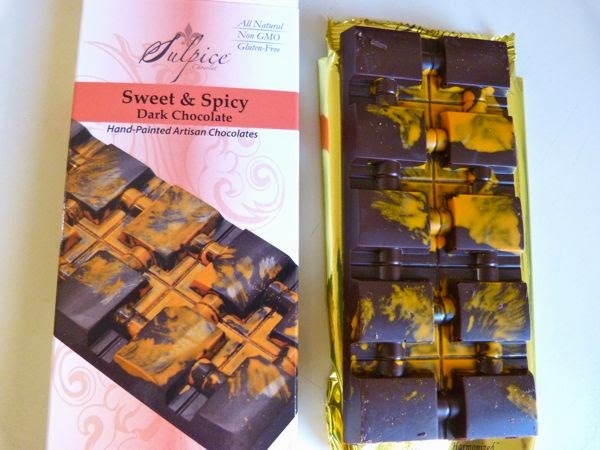 This Sweet and Spicy bar from Sulpice Chocolat (Barrington, IL) was splashed with warm-colored orange and yellow cocoa butter "paint," across the top; and the ingredients list promised a warming spice mix of cayenne, cinnamon and vanilla. The first bite yielded a smooth, dark chocolate taste and texture, but no spices. However, the cayenne kicked in after about 4-5 seconds with the cinnamon playing second fiddle to this fiery pepper heat. After peaking, the heat diminished a bit and left only a warm, cozy memory. This bar was made from "All Natural, Non-GMO and Gluten-Free" ingredients.